The 4R70W is a Ford transmission, and generally considered an evolution to the AODE, a transmission that it is often interchanged with. 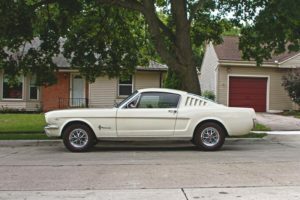 Both are improvements on the AOD, Ford’s first 4-speed automatic overdrive transmission, and its answer to the fuel efficiency issues first brought to light in America by the oil embargo of the 70s. Since then, improvements in technology and stringent regulations improving fuel efficiency and air quality have demanded better and better transmissions, while still providing opportunities for top notch performance, even if only through a few modifications. No stock transmission is perfect, but if you’re looking for a small-body Ford transmission with potential for insane performance and no need to mess with pesky throttle valve cables or old-school controls, then the 4R70W is a good place to start – but by no means the best place to end. Here’s a quick overview of the 4R70W, it’s relationship to other popular Ford transmissions, and a few things you should know about it, including its basic strengths, glaring weaknesses, and ways to improve on it and make it both more reliable and better for performance. It was around the 70s that automobile manufacturers started coming out with better, more fuel-efficient cars. These sacrificed some of the performance and speed of the gas-guzzling large-displacement carbureted V8 models of the past, in exchange for the ability to go long and fast at a much lower cost. While overdrive and general fuel economy were considerations for decades before the oil embargo, it was the steep increase in gas prices introduced by that decade that drove a change into American car manufacturing. It was around then that Ford first produced the AOD, its 4-speed automatic overdrive transmission, in 1980. The AOD was new, for sure, but mostly incorporated old designs. It didn’t change much from the FMX 3-speed automatics, save for a direct overdrive, and still used the Ravigneaux gear train and other common FMX components. It’s dependable and sturdy due to the inclusion of many of these true-and-tried components, but it’s the additions that make the AOD a liability. With a rather frail overdrive band lacking in proper width, it’s not uncommon for it to wear down quickly versus its newer alternatives. In comes the AODE. This was Ford’s improvement on the AOD, complete with a new valve body and computer controls to replace the classic throttle valve function and AOD valve body. The AODE was introduced in 1991, known simply as the AOD Electronic Control. It featured a completely revamped valve body, torque controller, front pump assembly, and a single input shaft rather than the primary and intermediate shafts of the AOD. • A 700 lb.-ft torque rating. The valve bodies and cases of the AOD, AODE and 4R70W are all different enough to warrant specificity – while you can take the gear train of the AOD and shove it into an AODE, you can’t switch their valve bodies. While the 4R70W is unquestionably better than its predecessors in many ways, that doesn’t always mean it’s the best option for you at the time. If you already have a stock AOD to begin with, there’s a lot you can do with some spare cash without having to invest in a completely new electronic transmission. While the 4R70W can be adapted even to older classic muscle cars, it does take a bit of work and a bit more cash than updating and reworking your stock AOD. The same goes for cars with the AODE in the 90s. The only time you might want to switch for the 4R70W is if you can afford it, and if you need the improvements. The main benefits of the AODE and 4R70W over their older version is the inclusion of a sturdier, wider overdrive band, better front pump, a solid input shaft, a switch from split-torque overdrive lock-up to the use of a locking torque converter, and finally, much improved pinpoint precision and control through computer-controlled components versus the oft clunky manual control given by a throttle valve function. Despite a thicker and improved valve body, the electronic AODs also come with a lighter case, built with aluminum rather than steel, improving weight and thus performance and fuel efficiency. The 4R70W is a good transmission, but it has its pros and cons. Let’s look over some of its best qualities, and some of its faults and issues. For one, it has a much better and improved overdrive band. Despite being a newer transmission and having a completely different case, the 4R70W is still compatible with a vast number of Ford vehicles without too much reworking or adaptation. You can easily retrofit it into many classic muscle cars, giving older vehicles a much-needed boost in both efficiency and performance. However, as powerful as it is, be careful not to overload this transmission. There’s a limit to its torque and power, and knowing exactly what it can and can’t do is the difference between an overheated transmission and one that will last you for decades. That, and as with any other transmission, you still need to maintain it regularly. Still, for all its merits and the improvements made upon the 4R70W after decades spent on feedback from the AOD and AODE, there are still flaws in the transmission that must be addressed through aftermarket improvements. A specialist in Ford transmissions can set you up with an improved 4R70W, with as much as 750hp, an improved torque controller, a much-needed improved cooler with a better GVW of 30,000, and countless reinforcements to improve durability, maximize performance in the long-run, and prevent some of the faults that eventually lead to complete transmission breakdowns in the future. Examples include an improved carbon fiber overdrive band, new pump assembly, higher capacity clutch, updated solenoids for better electronic functionality, and more. Be sure to only work with specialists who guarantee the quality of their transmission, and do their best to test the integrity of their work every time.